I don't like how STE creates a data file within the root directory of the application itself. Because I store STE.app within my Applications folder (where it belongs), I always see this ugly "extensions.data" file when I view the grid-view of my apps. I would suggest that the data file be moved to the ~/Library/STE/ directory instead, where app settings are commonly stored in the Mac OS. If you placed it in the "Users" library, then each user could have their own individual extensions settings. But given that STE.app is a specialty application, you may not need to have settings on a per user basis, and just keep it in the "global" library folder. I had a quick attempt at fixing this for 3.40, but due to some complications I reverted it back and left it how it was. To save to the /root/Library folder, you must have Administrator permissions. Otherwise, the changes you make won't persist between sessions. Most likely everyone using STE on a Mac at the moment is an Administrator of their machine, but I don't want to just rely on that being the case. This might make it harder for Mac and Linux users to copy those files to a different computer though (which can be particularly useful in the case of extensions.data, if the second computer doesn't have an Internet connection). 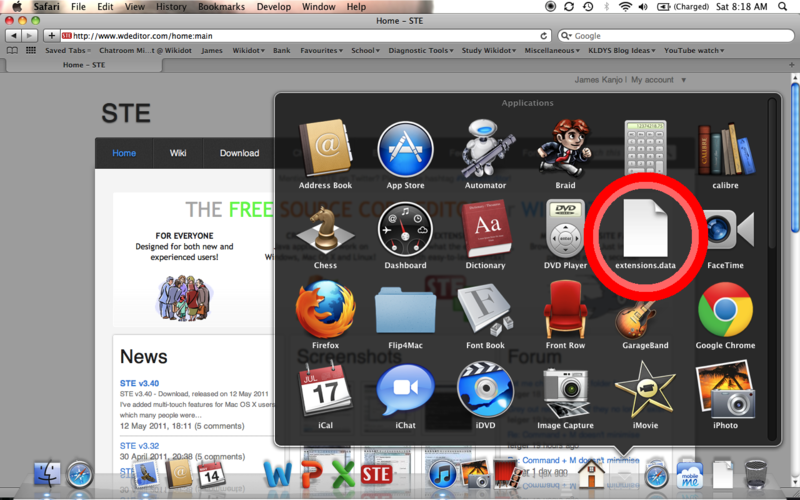 I'm not sure what the best way to access a hidden folder is on Mac OS X. Windows users can just type the folder name into the address bar (which Mac/Linux doesn't have!). Instead of making a hidden folder, why not just use the library folder in the users home folder (my option 2 above)??? Surely that folder doesn't require root privileges? The only "problem" you would then have is having settings on a "per user" basis (possibly a good thing after all). Yep, those folder locations will be default. But what I really want to do is to let users choose where to store config files, so you can move them somewhere else if you want. When you choose the location, a "Hide the config files" checkbox would be cool. Most likely I won't let you change the folder location in the next version of STE, but I'm implementing it in a way that makes this easy to add sometime in the future. Once I'm satisfied that this works 100% fine on all operating systems using these default folders, I'll most likely let you change it. Your existing extensions.data and recentdocs.data files will automatically be moved to the new location when you start STE. This check is performed every time (not just once) - making it just as easy to install extensions on a computer with no Internet connection: just drag-and-drop the file into the same directory as STE, then run STE to automatically move the file to the correct folder. Add reply on "Move extensions.data file"